The 2019 14th edition of the Tour will feature jersey numbers for finishers (currently at #63). The 2019 Tour also continues the popular "challenge point" system. For 2019 the Tour will involve 10 trail days and will cover 1750+ miles and over 250,000' of elevation. The Tour starts July 15th (earliest start) through September 20 (latest finish). Everyone is free to use the route information provided here in any manner they please. The trails that comprise the Tour are on public land (with a few noted exceptions). There are no guides and no one makes any money off this other than those who sold you what you need to ride a dirt bike in the wild and merchants along the way. All that we do at MoJazz is plan, publish maps and a route description and then go out and saw/maintain a lot of trail. You are welcome to the fruits of our efforts and most of you will be seraphically happy to just go out there, ride and just have fun on your own terms. But to participate in the event known as the Tour of Idaho one must accept a few additional challenges. The route the Tour follows has been ridden many times. Modern bikes, current navigation and communication equipment have made the Tour less daunting than it was even 15 years ago when we first started putting it together. Most Tour trails are of no more than intermediate difficulty - and though they are a blast to ride, the mere act of stringing them all together is not exactly an accomplishment of boundless magnitude. Fun? Absolutely. Special? Not in a spectacular sense. So we created the standards that define The Tour of Idaho to allow you to experience the Tour in a manner similar to that experienced by those who went before you. If you follow our standards you are, for all intents and purposes, experiencing all of the adventure that the pioneers of the route experienced many years ago. The Tour of Idaho is more involved and difficult than just riding the trails from one end to another. In 14 seasons there have been only 63 riders to finish the Tour (though hundreds have ridden the route). Failure is far more common than success. The Tour is an undertaking that requires a relatively uncommon set of skills - riding a motorcycle being only one among many. Tour of Idaho participants are expected to attempt the route in small groups (no more than three) without any support - no friends, family members, significant others or erstwhile Tour riding partners anywhere close to the route, no help with navigation, maintenance or anything else except what you find along the way. Tour riders have 10 trail days to finish but are allowed to take a day off in Pocatello. No other off days are allowed. No support is a core principle of the Tour. You are not permitted to ship anything to a location along the route, prearrange fuel or supply drops, or have someone bring you something that you need.. You must either carry everything you intend to use with you or purchase it along the way. No help and no supply drops. Tour participants are expected to ride all of the trails along the current route using only our 2019 route files and maps, to provide beacon links for live tracking and to submit a gps track file within three days of finishing the ride (for more on routes and tracks see below). Each day contains a minimum of two challenge points. All challenge points must be verified with a selfie posted to our Facebook group with the hashtag #tourofIdaho (use this same hashtag on your personal social media as well). This should be done as soon as possible (many CPs are in places where you may upload your photo immediately) but definitely no later than the evening after they were taken unless a data connection is not possible (which can happen in a few places). Most days have an optional challenge section (not the same as challenge points, which are not optional). Groups must complete a number of challenge sections equal to the number of riders in the group (up to three - the largest group size allowed). Some of the challenge sections are long, some are technically challenging, some are difficult to navigate and some are all of the above. Once you choose to begin a challenge section you must either complete it or turn around and back track to the original route then continue as if you'd not attempted the challenge section. No bailing out in the middle of a challenge section unless along a route designated for that purpose. The trails that compose the Tour are technically open from July through most of September. The Tour itself runs July 15 through Sept. 20. Most years those planning an early Tour (end of July or earlier) will spend a lot of time sawing trails or log hopping. Soloists are advised to start out no earlier than early August. Under no circumstances should any Tour rider use a trail that is marked closed. If a trail is closed (for fire, erosion or any other reason) it is not required to complete the Tour. The only expectation is that you rejoin the Tour route as soon as possible and do not use a detour to gain an advantage that would not be possible on the normal route. We grant exceptions to the "ride 'em all" rule for fires. In some seasons large sections of the Tour are unfortunately closed due to fire. In that event it's just not possible to finish. Riding a closed trail, for any reason, is a very likely DNF. Not being able to find a trail, or not being able to properly interpret a trail sign, is not the same as a closed trail. Any significant deviation from the published Tour route or the practices outlined above is considered a DNF (soloists have a bit more leeway than teams, but not much). Tour participants must join the Facebook group, the Facebook Riders group, consent to beacon tracking (the Garmin/DeLorme InReach SE is highly recommended) and must submit their complete track log for inspection within three days of finishing the route. As you can see the Tour of Idaho is a whole lot of work for little more than a bunch of folks monitoring your progress on their laptops and smart phones cheering you on. The effort to reward ratio is almost completely upside down. You will suffer greatly for almost no glory and very little tangible reward. Many will fail to finish. Many have ridden what they considered to be "95%" of the route but did not qualify as finishers. The details count. The Tour is as much a journey through one's own soul as anything else and is less a motorcycle ride than a bodacious outdoor adventure that happens to take place on a motorcycle. If you are just looking to check off another motorcycle ride you'd be way better off riding the route on your own terms or doing a BDR - where the odds of success are much higher and Interwebs bragging rights far easier to obtain (no slight intended, both options rock). But, if after pondering all of this, doing something much bigger than you just for the hell of it still seems like a good idea, read on. You'll need to check out the Tour of Idaho Facebook group for up to date information about the Tour. The group is open (except during Tour season) so anyone may explore the content without being a member. You should request to become a member only if you are serious about attempting the Tour (you must read the group description before asking to be admitted and there is some additional light screening). You'll also need to join the MotorcycleJazz.com forum before you set off. We'll establish a 2019 riders group there. You must indicate your interest in the 2019 Tour by joining the Tour of Idaho Facebook group and forum no later than June 1st, 2019 in order to be considered for the 2019 Tour. You will also find our FAQ and home page to be useful resources. Now down to brass tacks. There are three things that you'll need in order to maximize your educational experience here. 1) The patience and perseverance to read for comprehension (years of bitter experience have taught us that many Tour aspirants have minimal aptitude for this). 2) The capacity to fully grasp navigation and all of its nuance. 2a) The skill to read a map and route book. 3) The wherewithal to understand that you have never done anything a whole lot like this before. The 2019 route maps are available on this page (below) along with a 2019 Route Book (a condensed version of the route description below). The route files for 2019 contain widely-spaced waypoints (no bread crumbs anymore) so map study in advance of arriving at the start of the Tour is advised. The route changes every year and you will need to use this year's data in order to obtain the requisite number of challenge points to succeed. Every year at least one party shows up with a track they got from somewhere other than this site (a previous year's track is typical). If you do that we'll almost certainly figure it out and the odds are high you'll earn nothing more than a DNF. The ability to use a map, along with your route book and gps to navigate between points, is a large part of completing the Tour. This is deliberate and Tour vets almost uniformly describe navigation as not only one of the biggest challenges of completing the Tour (easily rivaling the riding skill required), but an estimable part of the fun. Our approach allows you to engage the route months before you are physically riding it and provides a rewarding (we are told) navigational challenge above and beyond following a line on an iPhone. Call it old school if you like. Weeks of map study and navigational preparation are advised and our methods are designed to encourage you to do just that. The payoff is that you will have little trouble finding your way while actually riding the Tour if you prepare in advance as we suggest. Take it to the bank. The best way to prepare for Tour navigation in advance is to reconcile our route waypoints with our maps, the route book and any notes that you make from observing our waypoints on Google Earth. You may then create your own route file from our waypoints to follow if you'd like, but that's actually more work than needed and may actually degrade your ability to navigate when you get here. We recommend that you simply add waypoints to ours as you see fit while studying the route (without overdoing it), upload everything to your GPS, and then use your GPS to navigate from waypoint to waypoint with maps as a backup. The reason for this is that every trail map we've used for the Tour is wrong in some places. It's inevitable. Trails change all of the time and keeping up is a problem for any map maker. Our waypoints are where then need to be and are accurate. If our waypoint looks like it's a quarter of a mile off of the trail on the map you are looking at I can all but guarantee that our waypoint is right and the map is wrong. Though this may seem excessive for those weaned on the ADVRider practice of following tracks created by others it will pay off on the Tour. Again, if you take the time to do this I can almost guarantee that you will have little difficulty navigating the actual route when you get here. For all GPS units here are the 2019 gpx files (right click and save): D1, D2, D3, D4, D5, D6, D7, D8, D9, D10. If you have further questions please read this before you email us about GPS files. The waypoints in the files are descriptively named, e.g., 1D = day 1, 1C = day one challenge section, x = one person team, y = two person team, z = 3 person team. So waypoint 3Dxy22 would be the 22 day three waypoint on the route taken by one and two member teams. A bit of map study will almost certainly clear up any confusion. A bit about GPS units. We recommend using three for the Tour: A Trail Tech Voyager Pro as a primary, a backpacking style GPS (Garmin makes several that are excellent) as a backup and a cell phone running Rever, Stava or something similar as a second backup. The Voyager Pro, in addition to being an excellent and very accurate GPS every without the external antenna, also provides reams of useful information about your motorcycle. For teams the buddy feature is indispensable. I use a Garmin GPSMAP 64ST, which I find to be excellent, as my first backup - but there are many similar GPS units that will work just fine. I use a smartphone running Earthmate paired with my Garmin/DeLorme InReach SE personal locater beacon as my second backup. Whatever you do, please do not use your cellphone (or worse, some sort of automobile GPS) for your primary navigation. None of this works very well for the Tour and the number of things that can go wrong is more than I can count on my fingers and toes. Get dedicated GPS units and keep your cellphone safely stashed away. You'll be happy that you did. If you feel the need to argue about this the Tour may not be right for you. Every rider in each team should carry three GPS units. The number of teams that have shown up at the flagpole with one or two GPS units between three people is a subject of much legend. And for the teams involved, much subsequent unhappiness. GPS issues hose as many teams as bike failures and personal fatigue. It's crazy to do as much work as you are going to do on the Tour only to be let down by something as easy to correct as the right GPS for the job. Make sure that at least one of the GPS units that you use is dedicated to creating a track of your Tour (as opposed to being used primarily for navigation). A GPS "track" file is not the same as a "route" file. A route file consists of a series of discrete, named waypoints that are created in order to plan a route. A track file consists of a a series of unnamed waypoints (typically a few seconds apart) created by a GPS as one travels. Our daily route files typically contain up to a hundred or so waypoints. Your daily track files will contain thousands. Creating a track is something that you should practice in advance and that you should check daily while on the Tour. We might accept a low-resolution beacon track for one day in event of some GPS calamity, but not for 10 days. Most GPS units create tracks almost by default. All you generally have to do is name them. Now for the 2019 maps. The daily maps at 100K resolution: D1, D2, D3, D4, D5, D6, D7, D8, D9, D10 and a 500K map. The color code on the maps is as follows: red = nominal route, green = one member team route variation, blue = two member team route variation, yellow = challenge section, purple = circumstantial alternative. Here is the 2019 Route Book. Here are the 2019 Challenge Points. The longest distance between fuel stops for 2019 will be about 230 miles and you'll have to manage this twice - very workable on most large desert tanks along with a Giant Loop fuel bladder or two. Finally, some miscellaneous helpful bits. We have an extensive collection of Tour of Idaho videos on our YouTube page. The SNOTEL page provides valuable information about the nature of snow levels on many passes along the Tour. Both ARCGIS and the Idaho Parks and Recreation OHV website have interactive maps with very high resolution views of the trails for the entire Tour. These maps are an invaluable resource for road/trail numbers, opening and closing dates - there's even an Inciweb layer available. For fire information check out the Idaho Inciweb page. The Idaho Digital Atlas contains a wealth of useful information about the Tour route. We also highly recommend the Roadside Geology of Idaho, an indispensable pre-ride winter read. Don't mess around. We recommend the best for the Tour of Idaho. A trail is much more than a line on a map - it's the sum of of the efforts of all who worked to make it a reality. We owe a great debt of gratitude to several individuals who helped us wrestle this epic off of our laptops and into the great outdoors. 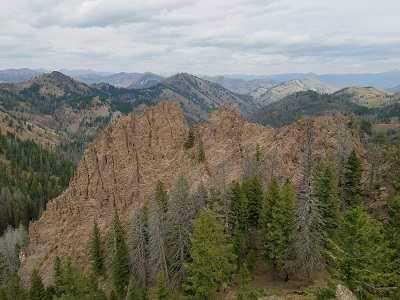 Tracy J. Gravelle, the trails coordinator for the St. Joe Ranger District of the Idaho Panhandle National Forest, spent hours with us on the phone and in exchanges of email planning the route through the St. Joe. Stacy Baker and Dusty Baker of the Challis District provided much useful assistance. The Challis district, btw, has the best trail crew in the state. Members of the Elk City Dust Devils ATV club are among the most helpful and gracious off-roaders it's been our pleasure to meet. They provided invaluable assistance in helping us with the area from the Magruder Road to Lowell. Many thanks to Donn Dennis who provided information on northern Idaho. Thanks to our friends at Pocatello Power Sports for keeping us in bikes, tires and accessories. Note: Nearly all of the small towns along the Tour route have at least one establishment with free WiFi. A WiFi enabled cell phone will generally be the only inexpensive way of checking in with family and friends at the end of each day and uploading challenge point photographs. A really good reason for not using one's cellphone as a primary GPS is that uploading Challenge Point photos becomes problematic if one's phone gets damaged or lost because it's exposed and vulnerable (it's happened many times). The following description breaks the Tour into ten segments. These are the intervals to which Tour participants must adhere. Based on our experience, competent, well-equipped parties traveling at reasonable speeds will have little trouble knocking off the entire Tour in ten trail days. The advantages of the suggested schedule are that accommodations are not generally a problem and the riding difficulties are distributed so that one day is not radically more difficult than the next. The intervals are as follows: D1 - Utah to Pocatello, D2 - Pocatello to Arco, D3 - Arco to Smoky Creek, D4 - Smoky Creek to Challis, D5 - Challis to Salmon, D6 - Salmon to North Fork, D7 - North Fork to Lowell, D8 - Lowell to Powell Ranger Station, D9 - Powell Ranger Station to Wallace, D10 - Wallace to Sundance Mountain. The average day on the Tour is around 180 miles. A stopover day in Pocatello (the biggest town along the route) right after the first day on the trail is allowed and recommended. Pocatello is the largest city along the route and the best place to sort out bike or equipment issues that you may have discovered on D1. You can change oil, tires, repack and take care of any maintenance in the biggest (and most well-equipped) town along the route. It also makes it easy to get the pre-dawn start that's a really good idea for D2. Pass on the allowed day off in Pocatello and the historic odds of success go way down. Please bear in mind that though we have covered every inch of the recommended route and believe our descriptions to be accurate, conditions can change, in some instances very rapidly, due to weather, fire, human activities, closures, etc. A group once got lost and abandoned the Tour because of a new trailhead parking lot. It's very common for people to miss trails or challenge points because they get tracks to follow from sources other than here. But as thorough as we've tried to be, the route description and GPS files provided here are no substitute for the ability to pull out a map and figure things out when you discover that you're not in Kansas any more. Those attempting to substitute a GPS unit for route finding and the ability to read a map will doubtless spend a lot of time lost. Again, navigation is a deliberately important part of the adventure. The Tour of Idaho is not a casual undertaking. Completing the Tour requires reasonably high degrees of riding skill, outdoor acumen, physical conditioning, navigational ability, mechanical skill, knowledge of emergency first aid and a healthy dollop of good luck. The information on this website is not meant as a substitute for any of the above. A trail that we describe as flat and fast, for instance, may change overnight as the result of a storm. You ride the Tour at your own risk. Any attempt to replace "eyes on the spot" judgment with something you read here (or elsewhere) may well result in calamity. You may want to check out the FAQ for answers to specific questions we've gotten (or wish we had). Please note that all estimates for time on the trail do not factor in the additional time required for extensive sawing or completing the more difficult challenge sections. In order to assist in assessing what you are riding into from day to day the "Touracles" (a group of Tour vets) have produced a series of trail ratings for the ATV and single track trails on the Tour. Please note that these are based on nominal conditions and that all it takes is one storm to change things. All ratings assume an unaccompanied rider with no support on a loaded Tour bike riding the trail for the first time. Remoteness, fatigue and technicality are all taken into account. The scale is from 1 (easiest) to 5 (most difficult) and the ratings are normalized to Tour of Idaho trails. The technical ratings are augmented with a scale borrowed from the MPAA we've pressed into use here to indicate mental stressors such as exposure, creek crossings and anything else that could ruin a Tour for the unlucky or unwary. No suffix indicates a trail that should be no problem for any competent solo rider of intermediate ability on a loaded Tour bike. A suffix of "PG" indicates slightly elevated risk. A suffix of "R" means that one should make doubly sure that their beacon is working. A suffix of "X" means to radio the tower and have them foam a runway. Finally we have attempted to quantify the quality of each trail. This, of course, is highly subjective and it is what it is. An asterisk (*) indicates a trail of above average quality. Two asterisks (**) indicates a trail of that is virtually overflowing with redeeming social value. Three asterisks indicates a veritable cornucopia of the most noble characteristics to which any trail may aspire. The Malad City Chamber of Commerce has arranged free parking in Malad, just a few miles north of the Utah border, for Tour of Idaho riders. Here is a kmz file that you may open in Google Earth that shows where the parking is, and here is what it looks like from the street. Just leave a note in the windshield of your rig that you are riding the Tour of Idaho (it might not hurt to check in with the local police either). The recommended accommodation in Malad City is the Hotel Malad, which is just a short jog from the parking area. Hess Lumber and Evans Co-op can take care of your last minute hardware and sporting goods needs. Utah/Idaho Border. Challenge point #1 Please note: you must complete D1 before midnight on the day you set out or it's a DNF. This is for your safety. If you get any reasonable start (before 6 a.m.) you should be in Pocatello before dark. If not the great wheel in the sky is trying to tell you something - and you should listen. Day one, though one of the shortest in terms of miles, yields long stretches of technical riding. Roughly 2/3 of the route consists of rugged single track, ATV or Jeep trail and the total elevation gain is between 30,000 and 42,000 feet (depending on exact route taken). There are several impressively long and/or steep climbs. Navigation is for real. Most will take 10 hours or so to ride the solo route and 12+ hours for the two and three member team routes - without the challenge section. Gas, food and water are not a problem with the longest distance between services being about 60 miles. D1 is designed to give you a taste of what is to come. If you cannot do D1 in less than 16 hours (in reasonable conditions, or if you find the riding and/or navigation to be overly difficult, you will find the days following to be desperately long and challenging. The traditional Tour start in Black Canyon has been changed to a much better start near I-15 Idaho exit #3 (Woodruff Road). This is an easy ride from Malad. From Malad take Old Highway 191 south some 10 miles to Woodruff Road. Turn left and head east over the freeway then right (south) another mile to the trail head at the mouth of Burnett Canyon. Head three miles east up Burnett Canyon to a ridge. Turn right (south) and head downhill a mile or so to the Idaho-Utah border (pictured left). This is the official start of the Tour. From the border head north six miles along a series of roads and ATV trails (70055 and 7488) to Dry Creek Campground. Follow the dirt road east out of Dry Creek (71224 then 70053) to ID 36, some 5 miles from the campground. Cross the highway and follow the road about 1/2 of a mile to an intersection. Turn north (left) and proceed 2.75 miles long a series of roads (King Road, 70242) to trail 7452. This trail is marked as non-motorized on some maps but is, in fact, a legal dirt road. Follow 7452 uphill (video) to 7451 (ATV) which leads to single track trail 7437. Follow this spectacular trail some 4 miles up and over Old Baldy (8356'), then Weston Peak (8165'). On the north side of Weston Peak look for an intersection with 7443 and continue north. Take trail 7441 east (right) a few miles to Buck Peak. Here the trail turns north and descends about a mile into Davis Basin. After Davis Basin the trail ascends the steep spine of Oxford Ridge gaining about 2000'. After a couple of miles of climbing one reaches a knoll near waypoint 1Dxyz19. From here the ridge levels off and heads northwest toward the summit of Oxford Peak. Near waypoint 1Dxyz20 there is a faint singletrack trail that heads off the west side of the ridge just before a steep climb to another knoll. Miss this and you'll regret it (especially on the way back). Park at 1Dxyz22 and hike a short distance to the summit of Oxford Peak (1Dxyz23). Do not ride your bike(s) along the final footpath. The Tour route descends from Oxford ridge east near Pine Corral Spring and descends an ATV trail (7419) steeply into Oxford Basin. The descent from the ridge is not obvious and a look at the GPS waypoints (video) will prove extremely useful. After a long descent to a small lake the trail climbs out of Oxford basin. A series of short climbs leads to a dirt road that goes east (right). Go left after 1/4 of a mile and head steeply uphill to a series of ATV trails (7419) leading some 4 miles to Aspen Hollow. Near waypoint 1Dxyz29 the D1 route begins to diverge with one, two and three team variants on the map. Soloists are free to skip the two and three member team routes and continue north to Pocatello. I would recommend that even soloists consider attempting the two member team variation. The two member team route is technical enough, in terms of both riding and navigation, that it will serve as a reliable barometer of one's prospects for future success. I'd estimate that anyone who can ride D1 along the two member team variant will, barring bad luck or some other unexpected calamity, succeed on the Tour. At least you won't encounter a more difficult day. Can you succeed on the Tour as a soloist without doing this? Certainly, it's been done many times. But if you want to know for sure, ride the two team variation. Soloists will descend to the northeast down Aspen Hollow (7416, 70050) to a farm road (Cedar Knoll Road) that rolls straight down into Marsh Valley. Follow this road about 4 miles to an intersection with Back Downata Road and turn right. Two and three member teams will head left (west) down Cherry Creek Trail (406) to New Canyon (420). A series of dirt and paved roads leads south then west to waypoint 1Dyz8 and the West Elkhorn Foothills/Kent's Canyon Trail (329, 334). These trails are a riot to ride, with just a bit of gnarl leading up to the pass near Kent's Peak to keep one on their pegs. Two member teams will turn right in Mill Canyon and head east down Power House Road. Three member teams will head west back up over the Elkhorn Crest, around the west side of the range, then back up to the Elkhorn Crest near Walkey Peak, then south and east back to where the variants merge again at waypoint 1Dyz13 (333, 336, 391, 330). From here it's just a few miles along some ATV trails (371, 325, 374) to Fenceline Trail (384, 331). Fenceline trail. Fenceline will test your navigational skills. It's incredibly easy to get led astray in the maze of criss-crossing game trails. Pay attention to your waypoints and look around before you twist the throttle. After Fenceline Trail the route follows FS044 to Marsh Valley road. From here a series of farm roads leads south then east toward Downey and a reunion with the solo route at waypoint 1Dxyz30. From here follow Back Downata Road east a few miles past Downata Hot Springs to US 91. Though it shouldn't be an issue at this point, gas is available a few miles north on Highway 91 in Downey or south at Swan Lake. Downata Hot Springs is a nice place to stop for a few minutes to cool off with a drink and a snack. After crossing US 91 the Tour jogs south about a mile to Calvin Road (Red Rocks Back) on the east (left), east along Pratt Road to Cottonwood Valley. 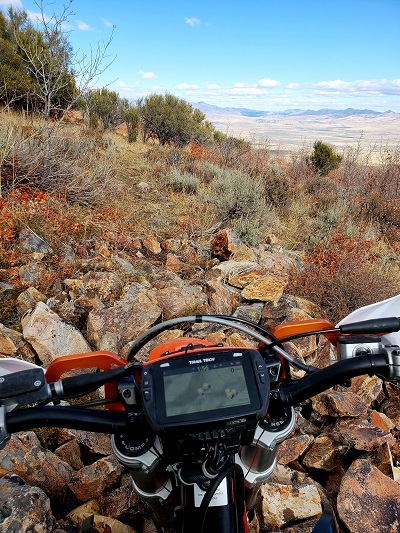 The route then follows a series of logging roads and ATV trails (video) that ascend to the summit of Sedgwick Peak (9167'). 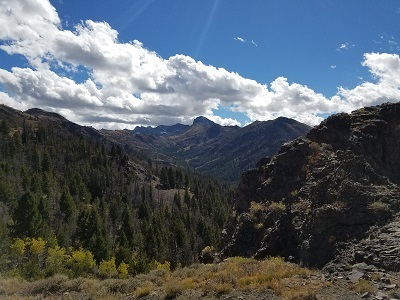 A series of roads follows the crest of the Portneuf Range northwest from Sedgwick Peak some 10 miles, eventually descending to Lava Hot Springs - a resort community that is an excellent place to stop for food and gas before the afternoon trek to Pocatello. We recommend the Sunnyside Store/Sinclair station, on the way out of town for a quick lunch and fuel stop. About a mile west of Lava on US 30, turn north (right) on Sunnyside Road (70030). Head north 3 miles up Beach Hollow (watch for a jog to the right near a house and a "dead end road" sign) to an intersection with the Boundary Trail (7272). Here the Tour route splits. The regular route continues west and north along the Boundary Trail some six miles to Robbers Roost Trail (7253). 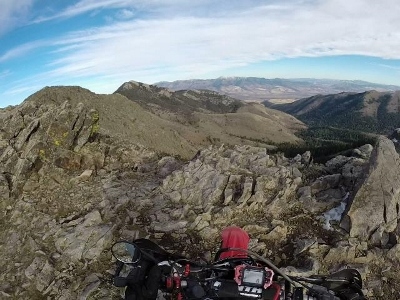 Robbers Roost is steep (video) and crosses the Portneuf Range crest just north of Haystack Mountain (9033') before taking the rider steeply downhill to Big Springs Campground back on the eastern side of the range. From Big Springs follow the Boundary trail north about 4 miles again to the Portneuf Range crest this time at Inkom Pass (7232'). The D1 challenge section follows the Boundary Trail (7272) east and north from Beach Hollow for several miles to Reed Canyon (7277), then up Reed to Girl Scout Camp Trail (7274, road 70022), back to the Boundary Trail a few miles south of Big Springs Campground. The challenge section then takes Robbers Roost Trail (7253) from east to west (reverse of the regular route) to the Boundary Trail and follows the Boundary trail north a few miles to Inkom Pass. It's permissible to bail out at the top of Reed Canyon and ride down Bob Smith Canyon to reconnect with the regular route. Why you should ride this. Because it's there. Why you should not. It's long and difficult right out of the chute and has ended many aspiring rider's hopes of completing the Tour less than a hundred miles in. There's a lot more ahead. From Inkom Pass follow trail (7243) from the pass first uphill and north then downhill and east to the South Fork of Inman Creek (video). Follow the South Fork Inman Creek single track (7240) north several miles (one of the most enjoyable trails of the entire Tour) to Inman Canyon Road. At the intersection with Inman Canyon Road head west (left) and descend several miles to an intersection with Rapid Creek Road. Inkom Pass From the intersection of Inman Canyon and Rapid Creek travel west into the small town of Inkom. Inkom is a good place for gas and a cool drink, if you choose, before the last sprint to Pocatello. Head north out of town and look for the Sorelle Road sign at the I-15 intersection on the north end of town. From Inkom head west about five miles along US 30 (all pavement, unfortunately) to Blackrock Canyon Road. Turn right and proceed under the freeway and north into Blackrock Canyon. Two and three member teams get a bit of a break at the end of the day here are are permitted to take a shortcut at 1Dyz78 that heads north along the Pocatello Range Crest several miles to Chinese Peak. The view are grand - especially around the time of day you'll be getting there. Soloists are required to head up into Blackrock Canyon for a mile or so past a parking lot on the left to a fork in the road. Take the right fork across the creek and follow the road past the Boy Scout Pavilion. Go another 1/2 mile to an intersection with a jeep road that heads left (north). Instead continue ahead and follow an ATV trail east that heads steeply uphill. Follow this uphill several miles to another ATV trail on the ridge. Go right (south) then left (continuing south) downhill a mile or so to Caddy Canyon. 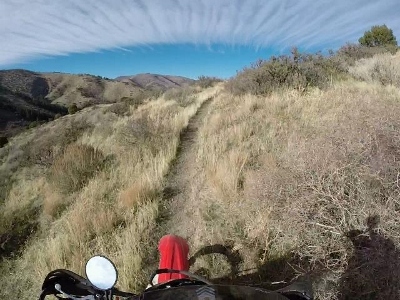 Follow this enjoyable and scenic ATV trail several miles north to a ridge, then about 4 miles west as a series of jeep roads and ATV trails wind to the summit of Chinese Peak (video). At several points along this trail you will be able to look back to the south and enjoy an evening vista of your entire day's travels. From the summit of Chinese Peak, the town of Pocatello lies in the valley to the west. Follow the wide, well-traveled gravel road that descends to the west. About three miles from the summit of Chinese Peak you'll encounter the TID flagpole on the left about 100 yards after reaching pavement (below the BLM parking area) at the top of Barton Road. This is the last challenge point of D1. 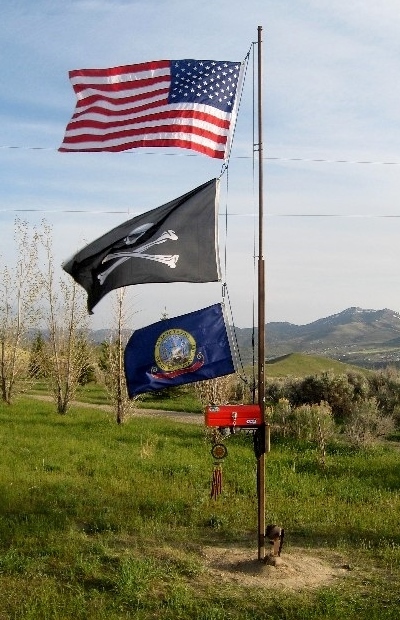 The flagpole is on private property. You are welcome to sign the register but please do not enter the property beyond the flagpole without prior arrangement. The signs warning of an electric fence should be taken seriously. You should also know that the llamas spit, the dogs bite and the folks who live there are armed, crazy and dangerous. Pocatello is the largest town along the Tour route. It's a full-service University community of over 50,000 with numerous motels, hotels, restaurants and shops of all kinds. We do not recommend any particular motel or hotel because all of the ones above "no tell" status are just fine. It is highly recommended that Tour riders avail themselves of the allowed day off in Pocatello to rest, sort out bike, equipment or personal issues that inevitably arise during the course of the first day. A day off in Pocatello also allows one to get a highly advised very early start for D2. Pocatello has a tremendous motorcycle shop, Pocatello Power Sports (Honda/KTM/Suzuki). A good Tour strategy is to "run what you brung" on your Tour bike on D1 then use your day off in Pocatello to have your bike serviced and shod in new tires at PPS. They understand what the Tour is about and all you have to do is call ahead and they can have anything that you need ready. They are great at getting you in and out during your day off. Make sure that you treat them well. 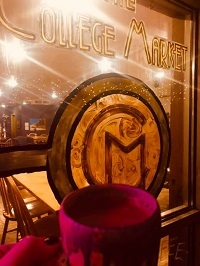 While in Pocatello, we recommend College Market for breakfast, lunch and coffee (they even have a sandwich called the T1), The Sand Trap, Mama Inez or the Sandpiper for lunch and dinner. Best bets for provisions and services are Pocatello Power Sports for motorcycle related needs, Barrie's Ski & Sports for general outdoor equipment and Fred Meyer for food and general supplies. Ethanol-free gas is available at Oak Street Sinclair (premium Ethanol-free is available at any local Sinclair). The local Red Wing Shoe store offers a free while-you-wait foot and boot inspection (custom insoles are pretty sweet) and boot cleaning for any Tour of Idaho rider who stops in. Jason Smoot has a variety of accoutrements for the feet that you ought to think about (1500 more miles is a long way to stand on your pegs). Please snap a selfie with the folks at any of these establishments that support the Tour and post on our Facebook page. While in Pocatello please be sure to patronize these supporters of the Tour of Idaho. Day two sets out along the world's mellowest motorcycle single track trail just as your coffee is kicking in and the sun is coming up. That last part is important because things get very interesting west of American Falls if you hit the desert sand in the heat of the afternoon on most summer days. Twelve or so hours ought to suffice at any reasonable clip. The longest stretch between fuel stops is 140 miles (between American Falls and Arco). Begin by heading west out of Pocatello to Gibson Jack Road (70008) and follow it to its end. At the west end of the parking lot find the ATV trail that crosses a creek and heads uphill (7015) for less than half a mile to an intersection. Go left (downhill) a short distance to trail (7018) which narrows to single track and heads southwest up Dry Creek. Follow this trail some 6 miles as it contours the eastern slopes of Gibson and Slate Mountains (video). Aside from some brief side hill moments of concern this trail is one of the best anywhere. You'll eventually descend to Mink Creek Road. Turn left there and proceed northeast for about a mile to a well-marked intersection with East Fork (Scout Mountain) road on the right. Follow this east for about half a mile to a parking area on the left. This marks the beginning of the Lead Draw trail (70331, 7109). Follow this east for for a little over a mile (video) and look for an intersection with trail 7133 on the right. Follow this trail south a little over 2 miles to a picnic area/campground. Proceed south through the picnic area to the Crestline Cycle Trail (7148). The Crestline Cycle Trail winds up wooded slopes to eventually emerge beneath the rugged and spectacular east face of Scout Mountain (video). After about 4 miles from it's start the Crestline Cycle Trail intersects road 70009. From here one turns right (west) and follows the winding road 2 miles to the top of Scout Mountain (8700'). Your first CP of the day is on top. The D2 challenge section begins at the aforementioned intersection. Just before the Crestline Cycle Trail intersects road 70009 one encounters trail 7178 (Bell Marsh) on the left (east). This 11-mile loop winds east down Bell Marsh, south then west along trail 7152 eventually reconnecting with road 70009 (you'll have to backtrack just a bit along 70009 to reconnect with the Tour route). Why you should ride it. It's far and away the easiest of 'em all. If you got off to an early start and the weather is overcast or cool go for it. Why you should not. Though short, this loop is time-consuming and soaks up a lot of time while not advancing you an inch (you end up back where you started). It is not recommended unless you've managed a very early start out of Pocatello because you do not want to get to the desert section of D2 much after noon. From the intersection of Crestline Cycle Trail with the road follow 70009 downhill less than a mile to an intersection with East Fork Trail (7186). Turn right (west) and follow this ATV trail about a mile west then north to Frog Pond. From there, proceed north another mile or so (video) to Race Track Trail (7184), a single track trail that veers sharply to the left (west). Follow this for about 3.5 miles west to South Fork Road (70163). This initial 20 or so miles of trail on D2 is among the most enjoyable of the entire Tour. But for a few miles of connecting roads and ATV trail it's almost entirely casual single track. The riding is mellow enough that one may enjoy the scenery in a manner that is often not possible elsewhere along the Tour. Head south (left) on South Fork/Mercer Creek Road for a few miles to an intersection with Garden Creek Road. Continue south another few miles to an intersection with Rattlesnake Creek Road. Turn right and proceed a few miles west to South Bannock Hwy. You'll proceed west into Arbon Valley and around Lusk Loop. Cross Arbon Valley Hwy and proceed due west toward the flanks of the Deep Creek Range. The road deteriorates to a jeep trail at a fence crossing at the foot of the range. Proceed generally west up Green Canyon. Near the top of the range the trail comes out of the trees and connects with Dry Hollow Trail (956). Head right (west) over the crest of the range (the day's second CP is on a knoll just off the trail) and descend into Portage Canyon toward ID 37 in the Rockland Valley. At the intersection of Portage Canyon Road and ID 37 continue west crossing ID 37 to Kuper Road. Follow Kuper Road west then south a few miles to Green Canyon Road. Follow Green Canyon Road/NFD 569 southwest a few miles to an intersection with NFD 579. Turn right (west) and follow this road as it descends Sheep Canyon for a few miles to an intersection with NFD 577 on the right. Head steeply uphill on NFD 577 to a pass and descend into Houtz Canyon. Follow NFD 577 down Houtz Canyon about 4.5 miles to an intersection with a road on the left that leads to Dairy Canyon. Follow this road uphill a mile or so to a pass and then descend another 3/4 of a mile into Dairy Canyon. Follow the road right at the first intersection and left at the second (indistinct) intersection short distance later. After the second intersection head uphill (west) to a pass just south of Badger Peak (6500'). There is a faint road that leaves the pass west and can be ridden a half mile or so to the top of a knoll. Your third D2 challenge point is on top of the knoll. From the pass descend 1.5 miles to a four-way intersection at the base of the hill. Proceed straight through this intersection and continue north 5 miles along Fall Creek to an intersection with Benson Spring Road. Turn right (continuing on Fall Creek Road) and head steeply uphill then downhill about 1.5 miles to an intersection with Register Road (paved). Turn right and head east on Register road to the Register Rock roadside park - a historic point on the Oregon Trail. Head east another couple of miles to Deeg Road on the right. Head east on Deeg Road 3.25 miles to an intersection with Rock Creek Road (paved). Head north 3.5 miles to the I-86 overpass and continue along Eagle Rock Road which runs east along the north side of the Interstate another 3.25 miles to an intersection with South Frontage Road that leads 2 miles into American Falls. The best place for gas and snacks in American Falls before the epic plunge into the desert is the Bingham Coop. There's a waypoint in the parking lot. The route out of American Falls proceeds west along ID 39 across the American Falls Dam. Just across the dam turn left (west) onto Lamb Weston Road. Jog around a few corners and turn south (left) on Borah Road a short distance later. Follow Borah Road south and west about a mile to a railroad crossing. From here follow Lake Channel Road 3.75 miles southwest and begin looking for a sandy dirt road on the right. The next 30 miles of deep sandy trail is one of the technical highlights of the Tour (video). Two things about the desert. The first is that most of it is private land owned by a few large holding companies. Some of us have ridden here for 40 years without any problems but the inconsiderate actions of a few are beginning to endanger this. Make sure that you close any gate that you open. Although you are very unlikely to encounter anyone who has a problem with you being there, if you do, find your way to the nearest power line road (all are easements) and just get back to the route as soon as you can. The second thing that's important to now is that perhaps nowhere else along the Tour is it as important to stay on the track as it is out in this desert. The consequences of getting lost in the middle of a hot day (or worse at night) are almost too awful to even consider. The trail from Lake Channel Road to Quigley Railroad Crossing, though reasonably well-marked, is at times difficult to follow. When in doubt the route goes in a reasonably straight line between waypoints and when it does not it's obvious what to do. It is important that you stay as close to the track as possible to avoid unpleasant encounters with trespass, basalt rock, cactus, nasty whoops, deep holes and other desert treats. On Tour veteran, a professional rider of vast experience, referred to the desert section of the Tour as "a beater." He wasn't making anything up. Personally I love the desert but I also recognize that it has the potential to be grueling and serious if you take it lightly. Most of the established tracks in the area are overused, whooped-out and nasty. Our track is designed to help you avoid the unpleasantness. In some places you'll be on an established trail but in those places the trail will be OK. If you examine the track carefully from where you first exit Lake Channel Road to to the point you cross it again you'll note that in some places it's way off on it's own and in others it appears to lie a few feet left or right of the main trail or a road. That's because in those places there's a motorcycle singletrack that was put there to avoid the whoops. You are required to follow our route through the desert as closely as possible and you'll get dinged some CP's if your track shows that you strayed very far from it. The normally fine, extremely dry basaltic sand in this area is the most difficult that some have ever ridden. Where the trails are whooped it's difficult to keep up the speeds required to stay on top of the sand. If you are very, very lucky, you'll get there after a summer thunderstorm and experience nirvana. It is incredibly important that you scout the rock chute entrance to Lake Channel, to make sure that you are in the right spot, before taking the plunge - as the surrounding cliffs reach heights of nearly 100'. Most attempts to do this after dark count as failed suicides rather than heroic deeds. Please note that it is very hot in the desert most of the time during the Tour of Idaho season (July and August anyway). Do not go out into the desert without proper hydration and ventilation. On a hot day the 140 or so miles from American Falls to Arco are very serious (110+ temps). Once you get out of the sand and into the basalt rock (after the first 30 miles) you'll be able to ride fast enough to cool down except for numerous gates that need to be opened and closed. The only real respite from the heat will be the summit of Big Southern Butte many miles to the north. Plan accordingly. To enter the sand, bear off Lake Channel Road at waypoint 2Dxyz84 onto a sandy dirt road and follow it about 1/4 of a mile to a faint trail that leads off to the west. Follow this another 1/4 of a mile to a well-defined trail that leads north down a canyon. After another 1/4 of a mile this trail climbs the steep left bank of the narrowing canyon then heads west along a fence line. Climb a sandy hill then follow a faint trail (occasionally marked with red ribbon) generally north up past large piles of lava rock to a power line road and a fence crossing. Head through the fence and proceed north for another 1/4 of a mile to a faint single track trail that heads west. Follow this trail, generally west, as it winds through dunes, sandy whoops and lava rock some 7 miles back to Lake Channel Road. There are a myriad of trails criss-crossing this area and you'll end up riding around in very tiring circles without paying close attention to the direction of your next waypoint. At times the trail is tenuous (look for red marking ribbon) but as long as you take your time and keep heading toward the next waypoint you'll be fine. At times the sand is quite deep and the dunes high and steep. 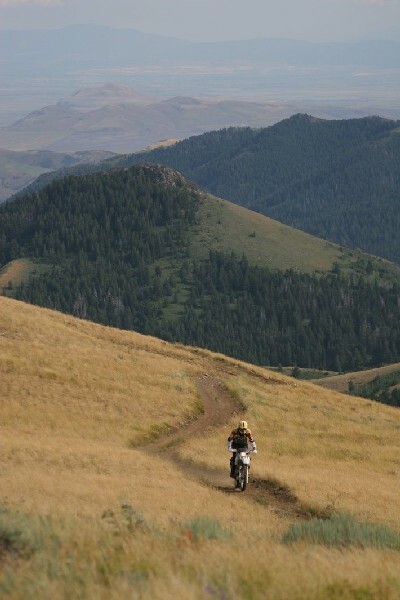 Though exciting these trails are well-ridden and mostly avoid serious hazards. Beware of large lava rocks, often hidden in the sand, that you may assume are bolted directly to the center of the earth. You'll need to keep up your speed to climb the omnipresent dunes, but at a level below reckless abandon (video). Your fourth D2 challenge point (2Dxyz113) is in this area. And, yes, you really do have to go right where the map and gps says the point is. On the west side of Lake Channel road proceed south then west about 1/4 of a mile to a cliff above Lake Channel Bowl. 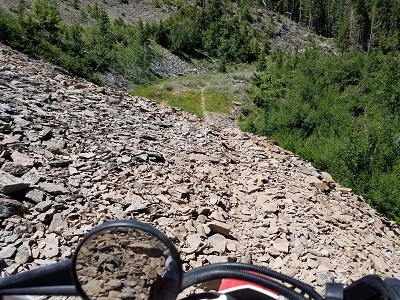 As previously mentioned it is advised that you get off your bike and scout the entrance to the bowl to make sure that you have the right one (a minimally technical short rock chute that's difficulty changes a bit with the amount of sand blown into the bowl below). Be aware that the cliffs in this area rise to about 100' above the bowl in some places and that you would be unlikely to enjoy the plummet should you choose your line poorly. Your fifth D2 challenge point is the top of the chute. Once into the bowl follow the waypoints half a mile to a climb out of the bowl on the right. Proceed along through a mixture of dunes, rocky roads, sandy roads and sandy trail about 5 miles to an intersection with a trail that heads north. Follow intermittent cow trails north a few miles to the third of three power line roads you'll encounter. Turn right (east) and head back to Lake Channel Road. Once there turn left (north), cross the RR tracks, and immediately locate a gate on the left side of the road. Head through this gate and proceed due north to the obvious large sand dune about 1/4 of a mile away. 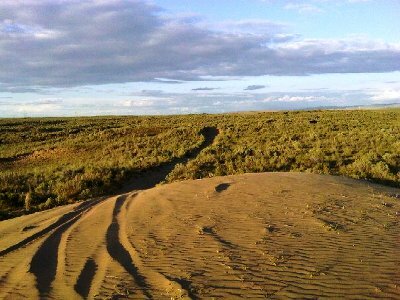 Head over the dune and follow an enjoyable single track trail north a few miles to Quigley road. From here the route skirts the east edge of the Wapi Lava Flow some 35 miles to the Great Rift - an area of lava tubes and deep chasms in the Basalt. Proceed north along Quigley Road some 10 miles north to North Pleasant Valley then along Schultz, Funk Roads and Classen Roads to Water Tank Road. The turnoff north (right) to Classen Road from Funk Road is unmarked but located where Funk Road turns from gravel to dirt. When the fields are planted this may be difficult to find. It is entirely possible to skirt the fields by continuing another half mile west to Winters Road, then turning right (north) and proceeding another half a mile to an east/west road on the south side of a fence line (Water Tank Road). No matter how you get there follow Water Tank Road east to Flat Top Road (0733). Follow this north about 7.5 miles to Gasten Beattie Well. Continue north along 0733 another 3.5 miles to Mosby Well. Continue north another 25+ miles to Big Southern Butte-Springfield Road. Along this section of the route it is very easy to get confused by a myriad of jeep roads and goat trails. From the intersection with BSB-Springfield Road turn left (west) and proceed a few miles to Frenchman's Cabin. The 6-mile trek to the top of the Butte begins here. On a clear day the view from the top (7560') includes a dozen mountain ranges, 1/3 of the Tour, most of T2 and parts of Utah, Wyoming, Montana and Idaho's Snake River Valley from the Tetons all the way to Boise (video). Your sixth and last D2 challenge point is on top of the butte. Big Southern Butte From Frenchman's Cabin the Tour proceeds west along Quaking Aspen-Frenchman Road some 10 miles around the southern boundary of the Idaho National Laboratory. Head west toward Quaking Aspen Butte and an intersection with the Arco-Minidoka road. Most of this section near the end of D2 is fast and flowing but you will be happy to see the lights of Arco glittering in the gathering darkness off to the north. Head north along the Arco-Minidoka road 14 miles to an intersection with US 20/26/93. Turn north (right) and proceed about a mile into Arco. Arco is a small community with an excellent motorcycle shop (Lost River Honda), a variety of eateries and several motels. It's a dirt bike friendly town, and anything short of wheelies down main street will probably pass without notice. We recommend the DK motel for accommodations but every place in town is pretty good to Tour riders. The folks at Lost River Honda have been especially helpful to Tour riders over the years. Treat them well. While in Arco please be sure to patronize these supporters of the Tour of Idaho. Burnt Aspen/Kane Creek Day three begins your journey into the very heart of Idaho and the best of what the Tour has to offer. Lots of single track and you'll encounter your first exposure to some side hills worthy of attention. Gas should not be an issue. Most will find this to be an easy day and unless you do the challenge section or are in a team of three you should be kicking back at Smoky Bar Store by late afternoon. The route out of Arco may be found off US 20/26 near the southeast edge of town. Look for the large submarine mast parked on the east side of the highway (I kid you not). Turn east (left) at the sub onto HiWay Drive which parallels US 20/26 southeast for a 0.3 miles to a fork in the road. 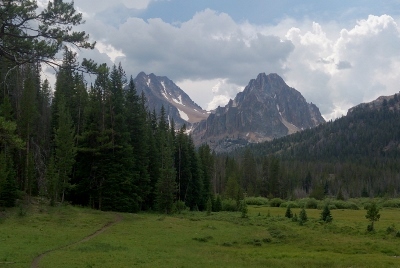 Take the east (left) fork 1 mile to an intersection with Arco Pass Road on the north (left). After about 7 miles the Arco Pass Road intersects Sheep Camp Road near the base of King Mountain. Head east (right) then north along a series of jeep roads that skirt the eastern flanks of King Mountain, up and over Arco Pass, down to Little Lost River Valley. You'll head north about 10 miles to the entrance to Sands Canyon ATV Trail (4210) at waypoint 3Dxyz18. Turn left here and proceed up and west several miles to a divide between Bird Canyon (west) and Van Dorn Canyon (east). Please note that this section of trail is seasonal and closes about a week before the Tour closes (September 7). Late comers will need to take the alternative route. From the tip of the divide take Mike's Trail (4308) a couple of miles down to a Jeep road that heads downhill to an intersection with Dorn Canyon (NFD431). Turn north (left) at Van Dorn Cutoff Trail (432) and soon after west (left) at Deer Creek Trail (277). About 3/4 of a mile later the route splits at waypoint 3Dxyz24. Soloists will follow Blacktail/Mud Lake (094) 11 miles to an intersection with Pass Creek Road (FS122). Teams will head north along FS527 and then FS235 to Deer Creek Pass, then downhill several miles to an intersection with Pass Creek Road (122). Proceed south about eight miles to Pass Creek Summit. From there turn west (right) and head up FS539 a mile or so to an intersection with trail 4092 on the south (left). This single track wanders around Warren Mountain some four miles to road 832 which intersects Pass Creek Road after a short distance. Turn south and and head a short distance to waypoint 3Dxyz25 where the routes converge. Head south down Pass Creek road a few miles to an intersection with Bench Road at waypoint 3Dxyz27. Turn west (right) and proceed several miles to the town of Mackay. Mackay has gas, grub and a hardware store so you can find about anything that you need there. From Mackay you'll head out of town to the south via Smelter Ave, west past Anderson Spring toward the entrance to Grande Canyon. At waypoint 3Dxyz32 turn to the south and up Alder Creek Road. About six miles later, at waypoint 3Dxyz34, you'll intersect Mammoth Canyon Road (517) and turn north (right). Head up Mammoth Canyon about a mile to road 40516 on the west (left) which quickly turns into trail 4070 in Stewart Canyon. Those who disdain quad trails as unworthy are in for a surprise. You'll crest 10,000' for the first time on the Tour here on the White Knob Mountain crest at the pass between Stewart Canyon and Corral Canyon. After the pass you'll descend north then west down Corral Creek a few miles to Burma Road. Take Burma Road south to East Fork Road - the main drag through Copper Basin. Head north then west several miles to trail 4056 that heads up Wildcat Canyon and Wildhorse Lookout (9359') - truly one of the more spectacular spots along the Tour. Again, for those who disdain all quad trails as unworthy, here's part II of your education. After the descent from Wildhorse LO, turn west (right) and jog down East Fork Road a short distance to Wildhorse Creek on the left. Head south along Wildhorse Creek Road (40136), past the Guard Station to Burnt Aspen Trail (4055) on the west (left). This trail is among the best of the entire Tour. You will enjoy the increasingly spectacular views as you wind your way up to the divide between Burnt Aspen Creek and Little Kane Creek - and they get even better as you wander down the Kane Creek drainage. At the bottom of Little Kane Creek you'll encounter a road (40134) that winds its way west around Phi Kappa Mountain to Trail Creek Road (NFS 208). From here the route heads west over Trail Creek Summit. From Trail Creek Summit you'll head southwest some 12 miles to Ketchum/Sun Valley Idaho - a.k.a. "Glitter Gulch." Bruce Willis lives here. So do Peter Cetera, Steve Miller, Arnold Schwarzenegger, Mark Zuckerberg, Demi Moore, Ashton Kutcher and Tony Robbins. Hemingway had a home here as well and that might've had something to do with why he volunteered for an early ride on the great wheel in the sky on July 2, 1961. I suggest taking the time to park your fanny on a bench in the vicinity of Whiskey Jacques and just take it all in (you are, after all, on a Tour of Idaho). The immortal words of Sophocles, "Oh, God, here comes the dreadful truth," will never ring more true. More than a few hours here and you will want to jab yourself in the head with a piece of rebar. Do not let the laid back demeanor of the locals wearing $300 sandals fool you either. Almost everyone staring at you and your bike dislikes you and hates your bike. Honest and no lie. Shall I fan you gently so you don't go into shock? The pass between Stewart Canyon and Corral Creek. Photo was taken from the Challenge Point. From Ketchum head west along Warm Springs Road (NFS 227) about 11 miles or so to Warfield-South Fork Trail (7151). Head southwest for a few miles until the trail climbs steeply through a series of switchbacks to an intersection with Red Warrior Trail (7120) on the left. Continue south, then west, then north to Middle Fork-South Fork Trail (7199) to Middle Fork Warm Springs Trail (7150) to Dollarhide Summit Trail (7995). Take 7995 west a couple of miles to Dollarhide Summit. The exit from the trail is a bit difficult to find but is very close to waypoint 3Dxyz74 off to the right in the middle of a steep uphill section of the trail. Someone usually piles up some logs here to block the trail but you'll most likely be to wheelie over them as the trail appears to continue ahead. It does, but only for another 1/4 of a mile or so. The D3 challenge section begins near waypoint 3Dxyz69 and continues along trail 7151 to Meadow Creek ATV trail (7302) back to Warm Springs Road. A right turn here leads you to the challenging part of the D3 challenge: Placer Creek/East Fork Big Peak Creek (7076). Why you should ride it. It's challenging and scenic. Why you should not. It's a long way to the intersection with Lick Creek (7080) and you'll need your big-person jammies some of the way. In nominal conditions it's an adventure. Please note that the first part of this closes very early each year (end of August). From Dollarhide Summit proceed west another 5 miles to an intersection with Trail 7016 (Big Peak) on the right. 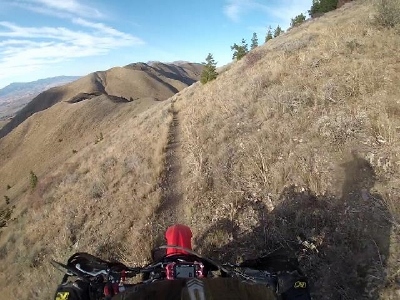 Follow this trail uphill a few miles to an intersection with trail 7081 (video). Follow this about 5 miles west to an intersection with Lick Creek Trail (7080). One and two member teams: continue straight on 7080 west 4 miles to an intersection with NFD 227 and Big Smokey Guard Station just a stone's throw down the road. Three member teams: Turn back right (east) on 7080, Lick Creek Trail, and follow it a few miles downhill to an intersection with East Fork Big Peak Creek (7076). Turn left (north) and head a few miles to an intersection with Big Smoky (7072). Beware of numerous creek crossings on Big Smoky Trail. More than one person has take an unplanned bath here. You might need to read this. Your day ends at Smoky Bar Store. You must make reservations in advance if you expect to have a bunk for the night. Please make sure to tell Kaylin, your host, that you are on the Tour of Idaho T1. She'll do her best to hook you up. Please note that the Smoky Bar Store does not have gas pumps but you should ask about options upon booking. Day four again traverses some of the most spectacular terrain anywhere accessible by motorcycle. It's 150+ miles of continuous fun with an elevated level of challenge - in terms of both riding and navigation. Fuel should not be an issue with Smiley Creek and Sawmill Station strategically located along the route. Somewhere north of 9 hours ought to suffice for soloists. A few hours more for teams. From the southern end of Big Smoky head north about 11 miles along Paradise Creek Trail (7070) to Snowslide Lakes. The first part of this is fast and flowing with just a bit of gnarl before Snowslide Lakes. After the pass at Paradise Peak you'll encounter what many will consider an introduction to "side hills of major concern" - a theme that will become much more prevalent in coming days. One of the reasons for starting D4 at Smoky Bar in 2019 was to give more teams an opportunity to see how far down it is off the side of the trail, in a couple of spots, in broad daylight. The good news is that it's only two switchbacks. After the second switchback head down mile or so to the West Fork of Big Smoky (224), then southeast just a bit over two miles and look for an intersection on the left with Mule Creek Trail (198) which is not well-marked. Trail 198 is a riot (video), and will aptly punctuate a great morning of riding as you follow it up several miles to the divide between the Smoky Mountains and the Sawtooths and an intersection with Big Smoky Creek Trail (072). From this intersection head north and follow the trail steeply downhill a few miles to an intersection with NFD 215. The small creek on your left is the origin of the mighty Salmon River. About 5 miles later you'll encounter ID 75. From here it's a short jaunt north to Smiley Creek Lodge where gas is available if needed. From Smiley Creek there are a variety of ways east to Grand Prize Gulch. The Corrals ATV trail (7259) is the best. If you detour north to Smiley Creek it is not necessary to ride all the way back down the highway to rejoin the route at the base of Galena Pass. Instead feel free to head east on Valley Road to Pole Creek Cutoff and hit Corrals Trail there. It's about 4 miles further to a intersection with Grand Prize Gulch Trail (7112). Follow 7112 uphill a few miles to the scenic view at the top of the pass. Continue downhill about 5 miles to the East Fork of the Salmon then another few miles further to NFD 120 near the Bowery Guard Station. From the Guard Station follow the East Fork Road about 8 miles to an intersection with the Little Boulder Creek Trail (7682) on the left. This single track is one of the highlights of the Tour (video). Follow LBC (7682) about 4 miles to a clearing with a spectacular view of Castle and Merriman Peaks, then another 6 miles (7407) up and over a pass and down to the mining town of Livingston (video). 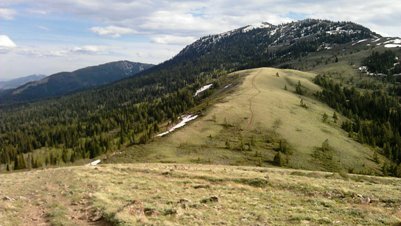 The next 5 miles (70669) climb steeply to the highest point of the Tour (10,420') atop Railroad Ridge where you'll want to pause to enjoy a vista that includes virtually all of the highest parts of Idaho and the spectacular Chinese Wall. Little Boulder Creek. The view from the Challenge Point. Proceed north 11 miles (70670, 7615, 7675, 2001) to French Creek where the trail narrows from dirt road, to jeep trail to single track as it descends down to the Salmon River. At the very bottom of French Creek, within sight of Hwy 75, the trail bears left to avoid private land near waypoint 4Dxyz43. Do not go through the gate to get to the road. Instead find the trail off to the left which climbs a side hill and descends toward a trailhead parking area. From the intersection with Hwy 75 head east about a mile to Old Sawmill Station where gas is available (24 x 7) along with supplies and some great sandwiches. Railroad Ridge - the roof of the Tour. The motorcycle is on the Challenge Point. From Old Sawmill Station, head west along 75 about 3 miles to a bridge which crosses the Salmon River on the right, The right of way on the north side of the bridge is private so head west another two and a half miles along 75 to a dirt road just the other side of a bridge that is a public right of way. Follow this back around to Thompson Creek Road (FS 040). Head north along Thompson Creek Road (FS 040) about 10 miles to a trail on the left (161) near waypoint 4D32. This trail is not hard to miss but you'll know you did if your start climbing steeply up a series of switchbacks. Follow 161 west about a mile and a half to Cinnabar Creek Trail (162). The last 1/4 of a mile up to Cinnabar ascends a steep meadow and the trail is a bit difficult to follow. The optimal path is marked by a series of rock cairns. Turn left (west) and follow the trail about a half mile to an intersection at a pass. Soloists may exercise the option there to turn around here and head east down Cinnabar Trail to Squaw Creek. Two and three member teams continue west. A very short distance to the west along trail 162 you'll encounter the D4 challenge section: Custer LO. This is a spectacular trail and a must do at some point in your riding career but one of the more airy and technical challenge sections on the Tour. Though short this four mile loop will test your meddle - including your ability to deal with dizzying side hills. It is recommended that you ride the loop in the counterclockwise direction only. You must go all the way to the lookout, which requires some extra work, to complete the challenge section. Why you should ride it. You'll never find a better view than from the top. It's one of my favorite places. Why you should not. It's a long way down in a few spots and some commitment is required to advance. Not advised for soloists. Soloists will ride east down Cinnabar then turn left (north) on Squaw Creek Road (400041). From there it's about a mile north to Trealor Creek Road (40045). Follow Trealor Creek road a mile or so to an intersection with a jeep trail (40695) that heads north. A short distance up this trail you'll encounter the Trealor Creek Trail (159) on the right. Two and three member teams will continue west down Fivemile Creek to an intersection with Yankee Fork Road (FS 070). Turn right and head northeast about six miles to Elevenmile Creek. Three member teams will turn right (west) and follow Elevenmile-Martin Creek (4148) and Mckay-Elevenmile to Squaw Creek. Two member teams will continue anther couple of miles along 070 to McKay Creek on the right. Follow McKay Creek Road about a mile as it turns into trail 151, then a short distance to an intersection with Squaw Creek Trail (149). About three miles south along Squaw Creek the two and three member team routes divide again. Two member teams will follow 149 south another 4miles until it turns into Squaw Creek Road (40041), then another mile to an intersection with Trealor Creek Road (40045) on the east (left). Three member teams will turn left (east) at Willow Patch and take the Buster Lake Trail (4152) west. All three routes intersect at 4Dxyz56 - the beginning of the Trealor Creek ATV Trail. In the beginning Trealor Creek is one of the worst beater ATV trails bad dreams are capable of conjuring. It gets better with elevation. Follow this five miles up and over Buffalo Ridge and down to Bayhorse Lake. Head down Bayhorse Creek Road about a mile to an intersection with a jeep road that ascends sharply to the left. Head up this road past Little Bayhorse Lake to a hard left at waypoint 4Dxyz60 and past a spectacular rockslide. Continue east a few miles to the summit of Ramshorn Mountain and east a few more miles over Keystone Mountain to an intersection with the Keystone Gulch jeep road. From here, ascend Keystone Gulch and hang a left (waypoint 4Dxyz69) at the Lombard ATV trail (4639). Continue northeast past Blue Mountain (video). 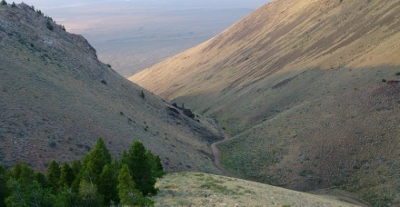 Just a few miles outside of Challis, a mile or so below the pass north of Blue Mountain, the trail splits (waypoint 4Dxyz74). The right fork descends to the State Park at Yankee Fork (a fee area). Take the left fork, right down the creek bed, a few miles into Challis. Challis (5000'), at about trail mile 700, is about the same size as Arco (population 1200) and has about the same level of services. There are several motels, half a dozen or so eateries and plenty of choices for gas and supplies (The Village Square on U.S. 93, is particularly well-equipped for your TID needs: straps, gas jugs, tools, outdoor equipment - we even found 2 and 4 stroke motorcycle oil there). Ethanol-free gas is available at Kimble Oil and Brett's Automotive. The Challis Village Inn is our favorite place to stay in Challis but there are several other perfectly fine motels. Any of them will work. You should know that the owners of the craft brewery in Challis have expressed unfriendly views concerning motorized recreation in public meetings. PBR is better for you anyway - and it mixes great with Pedialyte. If time permits the Yankee Fork Interpretive Center (south of town at the intersection of US 93 and ID 75) is well worth taking the time to visit. Please note that accommodations in Challis are generally unavailable during the Braun Brothers Reunion which will be held August 8 - 10 in 2019.